The curly arrow in reaction mechanisms is one of the most iconic figureheads of chemistry. It allows us to derive, describe, and rationalize bond re-arrangements during a reaction. And, retroactively, the controversies over priority and the feuds between Robinson and Ingold (I’d like to call them the father and the mentor of the arrows, respectively) make a good showcase for how science is not always played nice—but even that cannot stop a good concept from taking over. Nevertheless, one thing which has never been clear is how the curly arrows relate to physical reality and first-principles quantum mechanics. Unlike everyday objects, electrons in molecules always behave as quantum mechanically, and one electron is fundamentally indistinguishable from the other. That means that, according to our physical understanding, it does not even make sense to ask whether or how a lone electron pair attacks a molecule at a certain position—the question is already ill-posed at identifying the electron pair which is attacking. Electrons cannot be distinguished, after all. Added to that, the bond transformations written down in curly arrow pictures show little resemblance to anything which can be read off of canonical orbitals obtained from Hartree-Fock or Kohn-Sham DFT. However, in the just-online paper Electron flow in reaction mechanisms—revealed from first principles, Johannes Klein and I were able to show that the curly arrow mechanisms CAN be identified in first-principles quantum chemistry—and all one has to do is to follow the change of intrinsic bond orbitals (an exact, localized description of a realistic ab-initio wave function) along reaction paths. The key here is that (a) we follow the orbitals along reaction paths (i.e., we do not only look at the starting and end structures, but also everything in-between) and (b) we follow bond orbitals, not electrons. Orbitals are not indistinguishable. While this approach may seem obvious in retrospect, the connection between localized orbitals and curly arrows seemed to be completely absent from the literature. 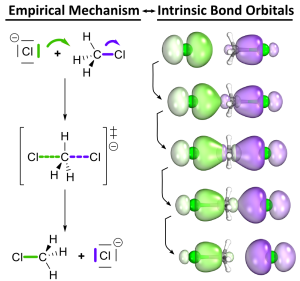 The matter is complicated by the fact that, apart from the IBOs, not many orbital localization techniques can follow the bond transformations; in particular, the immensely powerful Natural Bond Orbitals of Weinhold, which have been (and still are) the primary tool for interpreting electronic structure since two decades, cannot do this directly. 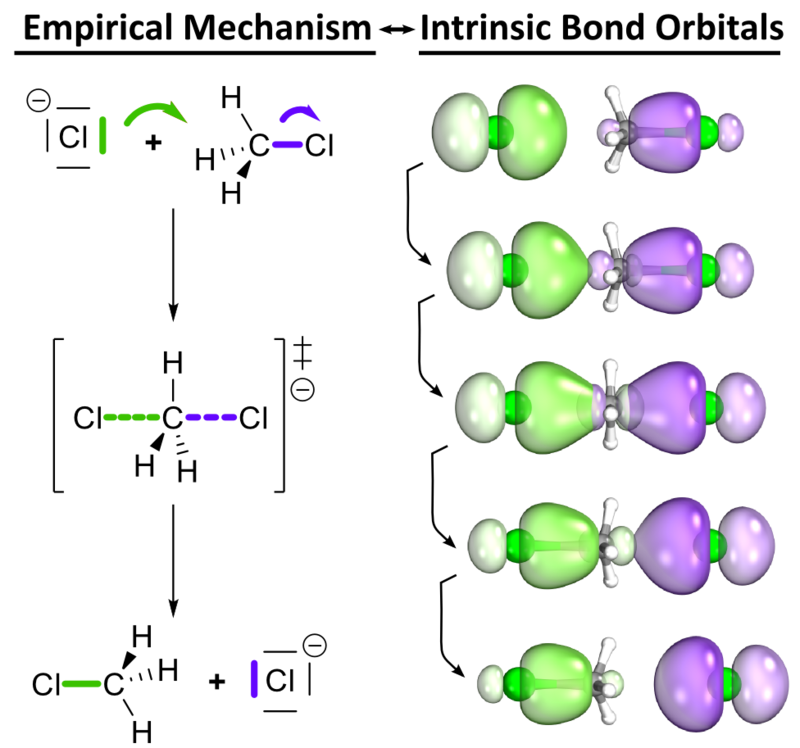 We hope that this direct link between first principles quantum chemistry and empirical reaction mechanisms will prove useful in understanding reactivity in real world labs. I certainly see a lot of potential in the technique. And, as a sceptic myself who is more familiar with viewing molecules as sets of a few GB of unknowns which need to be solved for, I was quite surprised with how suddenly everything fell into place. If you want to try it yourself for your own reactions: You can, with IboView, which was also just released. This entry was posted on Thursday, March 5th, 2015 at 14:23	and is filed under articles, research. You can follow any comments to this entry through the RSS 2.0 feed. You can leave a comment, or trackback from your own site. Hello, Everyone! New Site Launched. © 2019. Gerald Knizia Research Group. Powered by WordPress. Cleanr theme by WPShoppe.